This is a long-awaited and much-promised recipe. This stuff is amazing. I wanted to show you a beautiful full jar, but, well, I just can't seem to keep it in the house long enough to photograph it. This was as close as I could get. When spread over the top of buttered toast, it tastes like a cross between banana bread and cinnamon rolls. It is, by far, the most favorite recipe in the house. It's also perfect for using up those few leftover mushy bananas. You can throw them, unpeeled, into the freezer, and just thaw and peel them when you have enough. This recipe is easily multiplied, but as bananas don't really have a season here in the Northeast, I honestly don't bother. Pour mashed banana into crock pot, and cook on low, with lid off, stirring about every half hour to an hour, until banana is slightly drier than desired finished product. About 8-10 hours. The idea is to slowly caramelize the banana, before adding any other ingredients. Add remaining ingredients, and stir thoroughly. Adjust consistency if necessary by cooking down or adding water. Cook on high, covered, until banana butter is steaming. Sterilize one 8 ounce jar and lid. 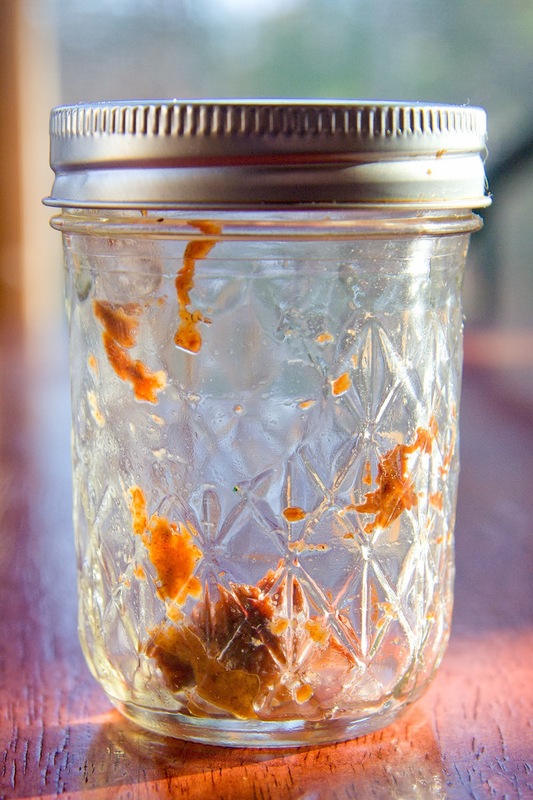 Pack banana butter into the hot jar, leaving ¼ inch head space. Cover with lid, screw band to fingertip tight, and let it cool completely on the counter. This is not shelf stable, so just place it in the refrigerator.